The TOPENCA SUPPLIES Small-Size Double Slicer is constructed from thick stainless steel, and is designed to last. Whether you use it on pastries or pasta, it won't break, and it won't rust, is dishwasher safe and extremely easy to clean. Our tool was designed with one clear focus - to cut pastries and pasta perfectly every time. No more wasting time with a knife - get it done with the right tool for the job. FIVE COMFORT STRIPS at the thumb give you superior control for cutting that perfect, delicious slice of pasta. HIGH-QUALITY STAINLESS STEEL and lightweight polished aluminum ensure that this attractive kitchen accessory is rust- and stain-resistant and dishwasher-safe, making clean-up and maintenance a breeze. CONVENIENT THUMB GUARD keeps your fingers safely away from the blade while providing a leverage point to deliver as much or as little pressure as necessary to cut through any size of pasta. MAKE QUICK WORK of cutting fresh herbs. Topenca Pastry Raviolli Double Cutter chops in both directions, cutting meal preparation time in half. For extra control toss a pinch of salt on your cutting board before you begin. 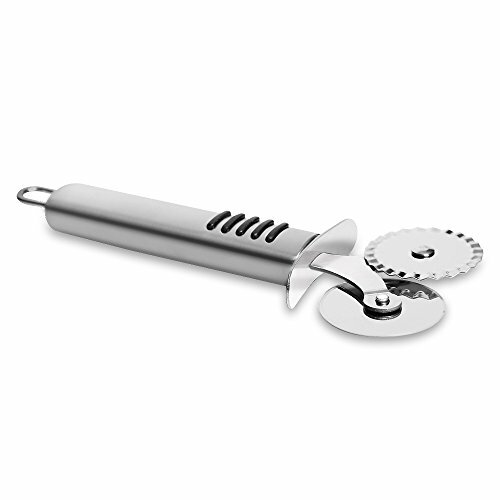 30-DAY SATISFACTION GUARANTEE gives you a full risk-free month to try the Topenca Pastry Cutter. If you are not fully satisfied simply return it for a full no-questions-asked refund of your purchase price. View More In Baking & Pastry Utensils. If you have any questions about this product by Topenca Supplies, contact us by completing and submitting the form below. If you are looking for a specif part number, please include it with your message. R&M International 2743 Pocket Pie Maker, Apple Shape, 5"